Golf Zoo's Blog - Golf Vacation Packages, Company Updates, Specials, Golf Courses, Reviews and Rants. Coming here to Scottsdale, and not sure where to stay? Here are my "Top 5" options as to where to stay and why...from a twosome to a group of 12, these in my opinion are the best options in the valley of the sun! 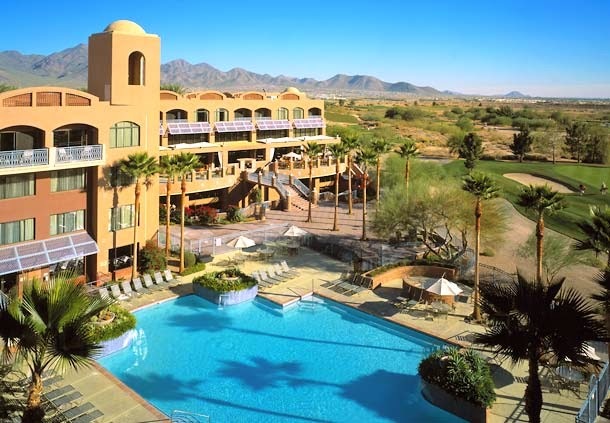 Scottsdale Resort and Conference Center - I love this option as it's a full service resort in a perfect location, and won't cost an arm and a leg even in peak season. The Scottsdale Resort is located in the heart of Scottsdale, has large rooms that are great for double occupancy, and has one of my favorite bars in the valley, Sangrias. You can hang out, enjoy the famous "Fab 5" cocktails for 5 bucks, enjoy really good music, and shoot a couple game of pool. This is my #1 choice for "double occupancy" groups coming to Scottsdale. Private Estate Homes - Have a group of 8-12, and want to hang out under one roof? Our 3 Private Estate Homes located in Fountain Hills are perfect. All 3 are large homes that will sleep up to 12 golfers, each with their own bed, and are decked out with all the goodies that golf groupies love... pool tables, poker tables, private pools and Jacuzzis, putting greens, ping pong, and more. This setup is perfect for a hassle free vacation, as all 3 are less than 10 minutes from We-Ko-Pa, SunRidge Canyon, Eagle Mountain and Desert Canyon clubs. Play golf, come back, grill some steaks, have cocktails and relax with your buddies - that's what the Golf Zoo Private Estate Homes are all about. Villas at Legend and Tradition at Kierland - This is a great setup for foursomes. We have 1, 2, and 3 bedroom options here that are located right in the heart of the Kierland Commons area, so tons of restaurants and bars are within 5 minutes. Also a great location to get to the golf in North or Northeast Scottsdale. (TPC, Troon North, Grayhawk, Legend Trail, and of course Kierland Golf Club iis right there) The nice thing here is plenty of space, and the ability to customize the bedding. (Can have 1 King, or 2 twins in each bedroom, and easy to modify.) Very economical, even in peak season. Hyatt House - Old Town Scottsdale - golfing during the day, and bar hopping at night? Hyatt House is your spot! Located in the heart of Oldtown, Hyatt House has 2 bedroom suites with living rooms and full kitchens that are perfect for twosomes, threesomes, and foursomes with the standard two bedroom King/King, the "Trio" with King and 2 doubles, and the very popular "Quad" that has 4 double beds for foursomes. A little more pricey than the condos, but it's all about location and convenience. The free full breakfast buffet (with omelet station) gets your day off to a perfect start. Marriott at McDowell Mountains - I love the "Triple M" because all the rooms are true suites (separate bedroom and living room) and is a more "upscale" setup at a great value, with a perfect North Scottsdale location. It sits right on the TPC Champions course, and is only "a par 5 away" from the TPC Stadium Course - Home of the Phoenix Open. Beautiful lobby with a great bar and grill, Agave. Perfect choice for couples, the upscale suites at a decent price, and prime location make the Marriott at McDowell Mountains a no-brainer. Well there it is my "Top 5" for Scottsdale lodging. Whether you're a twosome, foursome, or a large group, one of these spots will make for a great Scottsdale Golf Vacation. You can also see my "Top 10 Scottsdale Golf Courses" and call me at 888-867-6911 and I will email you a complete customized itinerary. Have fun and hit em straight! Get Your Online Trip Quote Now! Golf tournament will complete your vacation! Who wants to share bedrooms??? NOBODY! Golf industry veteran, Marcus Blake, joins the team!